I will, this July, hike Mount Kilimanjaro. It is an audacious goal, one I am both challenged and inspired by, and more importantly, one that aligns with my purpose of empowering others to navigate their life journey and stand in their brilliance. This hike is an opportunity to be in service to those in need, to help save lives through service, and to celebrate the 15 year anniversary of Samaritan’s Feet, an organization and a founder, and friend, Manny Ohonme that do so much good for so many. His organization and vision have helped to save the lives of countless people by providing them with shoes. 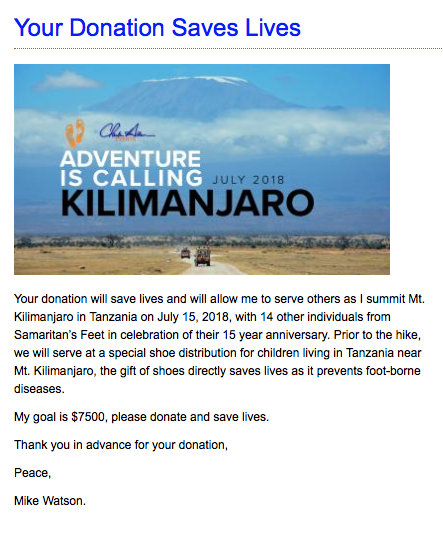 WHY shoes: 1.5 billion people are infected with foot-borne diseases that could be prevented with shoes and shoes are the fifth most needed item by students in the U.S.
What I am asking is that you take a moment and donate to my hike of Mount Kilimanjaro so we both can save lives by providing shoes for those in need. When I land in Tanzania I will, before my hike, take part in honoring those in a nearby community by washing their feet and providing shoes, in this way I can directly contribute to the well-being and health of others, and be of service to something greater than myself.